In the Name of Allaah, the Lord of Martyrs !! Assalaam Alaikum Wa Rahmatullaah Wa Barakatuh! Alhamdulillaah Shaheed Foundation Pakistan is currently serving 1542 families of martyrs in 55 cities right across the length and breadth of the beloved country . 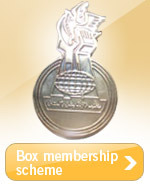 By the Grace and Continued blessings of the Holy Masoomeen [Alaihimussalam] ,every day in this untiring one and a half decade of journey has been replete with worthwhile experiences and observations,which helped this institution transform into the kind of reputed name that it has become now. In the most difficult times where realistically speaking hardly could have anyone imagined in the wildest of dreams that such a comprehensive system of extending multi-pronged services could continue to perform on a sustainable basis . Adding continuous value to the effort and transforming it rapidly to stay abreast with modern day needs has remained a constant challenge for this unique institution of its kind and Alhamdulillaah with the blessings of Imam-e-Zamana[atfs] , deep-rooted support from Millat-e-Jaffaria Pakistan , an un-compromising faith of Khanwada-e-Shohada in this ace institution of theirs' and selfless efforts of sincere brothers and sisters , Shaheed Foundation Pakistan has proven its mettle by making happen things which seemed impossible only a few years back . Alhamdulillaah . Central Committee ,Shaheed foundation Pakistan pays our heartiest salutations to the glorious Millat and Khanwadgan for your un-conditional and a magnanimous all out support for the noble cause of martyrs which enables this system to disburse amounts in excess of Rs.1 Crore each month . Indeed the way this system has strengthened itself and earned repute despite all kinds of challenges is a living miracle of Imam-e-Zamana[atfs] ,we beseech him to remain our guide in all what we do and steer us to the best decisions. Without any doubt this institution has significantly contributed in re-vitalizing the message of martyrs and martyrdom in Pakistani society and is proof enough that if we decide as individuals and as nation to direct all our energies and priorities in the way of Allaah ,HE indeed helps from the unforeseen and provides deep insight of issues as well as automatically mobilizes resources . The greatest thing that every one notices is the frequency with which one after the other this caravan is joined by exceptional momineen with diverse capabilities.The strength as well as inspiration one draws from these momineen can only be felt and not described . When this system began in its current re-organized form in 1997 , there were multitudes of challenges confronting the nascent institution . Firstly the loss of a towering figure like Shaheed Quaid Allaama Syed Arif Hussain al- Hussaini [RA] was being felt immensely as he was such a spiritual personality who had laid the foundation of this institution in its primitive forms on the ideology of Imam-e-Raahil Imam Khomeini [RA]. When Shaheed Hussaini was martyred in 1988 the system of catering to needs of shohada was also adversely impacted much like the other areas . The greatest loss was a deep anxiety and trust deficit in millat owing to events which were witnessed in later years as the Millat indeed felt itself to have become orphaned . In 1997 , three youths in their late teens /early twenties decided to put faith in Imam-e-Zamana [atfs] and began the work of re-starting the effort in an organized form. Contacts and consultations were made to obtain formal ascent of ulema-e-karaam and khanwadgan . With more brothers joining soon a central committee was constituted and services for a very few families were started . Though resources were thin , the morales were sky high . Holy Masoomeen [AS] enabled the youths to obtain deep insight of different issues and chalk out a broad frame work of policies and objectives. It is indeed amazing that the most useful fundamental rules seem to find their relevance more and more with each passing year and as part of dynamic approach amendments are done within the broad confines to fit the needs of this day and age. Alhamdulilaah quickly within very short span of time things the Khanwada-e-Shohada magnanimously bestowed the institution with their approval and ascent for the humble services offered to them. Although resources were very thin but the kind and quality of efforts has been so strong that become the first introdution of Shaheed Foundation Pakistan. Although a lot lot more needs to be done , but in the first phase of these years ,the basic issues related to Shohada families were tackled to a significant extent , like health,education ,medical ,counseling and personality development of the children and families and it has been a tremendous learning all through for all . Quickly the same things were started for deserving families of non-shohada families too under general welfare Light for Life . Indeed some way has been traversed and precedents set for others to deliberate and lot more needs to be done. Another important phase which was conceived very early was attaining complete self reliance for the institution . Alhamdulillaah continuous analysis and introspection helped begin ground work on megaprojects for this to streamline expenses and offer better sevices to the families . Al-Shaheed Hospital,Markaz-e-Asar-e-Shohada wa Nigehdasht and al-shaheed saqafti marakiz are projects which not only address needs of families but also help re-rolling of finances to make the institution completely self reliant on which work is continuing at quick strides. After thorough consultations and initial homework ,Central Committee is pleased to announce the launching of Al-Shaheed Housing Scheme Project. 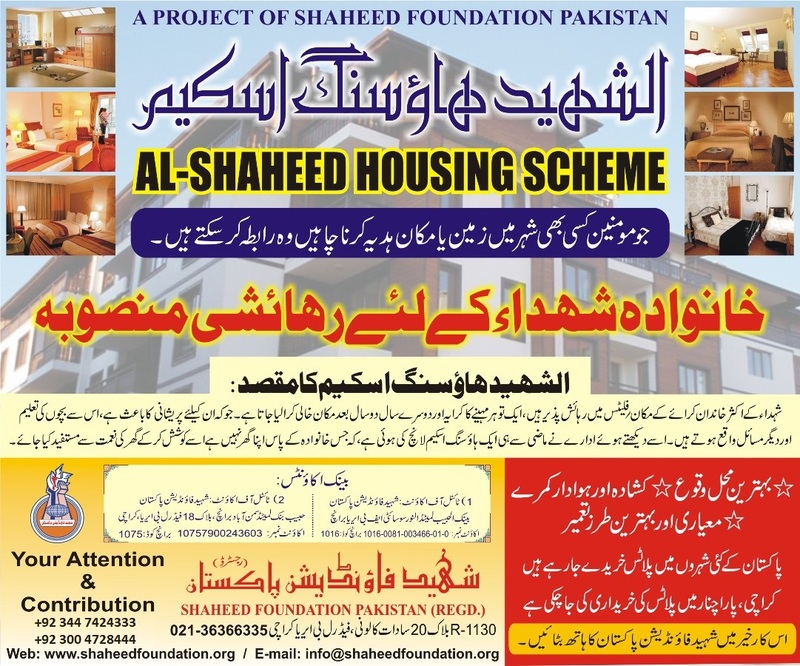 Establishment of housing colonies and apartments for those families of martyrs across the country who are living on rental basis will significantly minimize the financial burden under the house rent expenses head .It will provide quality accomodation to martyrs' families and remove the hassle of changing rental accomodations over and over again. For this purpose extensive consultations with expert town planners,civil engineers,architechts ,material estimators and philanthropists have helped define the broad contours of these residential colonies. In some cities ,large chunks of lands have been acquired and efforts are underway to begin solid foundation work on this mega-project . We are continuously looking for momineen who would like to participate in acquiring land in different parts of the beloved country and those who can provide material /financial support . We strongly welcome momineen to join hands in this noble endeavour and contribute to the cause of martyrs in this sphere too. We pray to Allaah by the right of Holy Masoomeen [Alaihimussalam ] and by the right of the sacred blood of the beloved martyrs to immensely bless all the momineen o mominaat who in these stiff times of inflation , accord high priority to the children and families of martyrs and save amounts to be utilized for the cause of martyrs . Only Masoomeen [Alaihimussalam ] can reward this spirit of sacrifice of our great millat manifolds ,as these families and children are the benefactors of not just the millat but the maktab-e-tashayyu itself. The Holy over-seers of this maktab ,the Holy Masoomeen [Alaihimussalaam] indeed alleviate the sufferings of anyone who sincerely tries to alleviate the sufferings of the martyrs' families. We beseech the Holy Masoomeen [Alaihimussalam] to grant us an unwavering faith and wholehearted dedication to this glorious cause ,accept our imperfect efforts,guide our decisions ,give us the strength to join the martyrs in their ranks following the exalted path of Ahlulbayt [Alaihimussalam] and make us bright faced in front of the beloved martyrs on the day of judgement. We request you to please circulate the message among your contacts ,acquaintances,families and friends to muster up support for the noble cause . 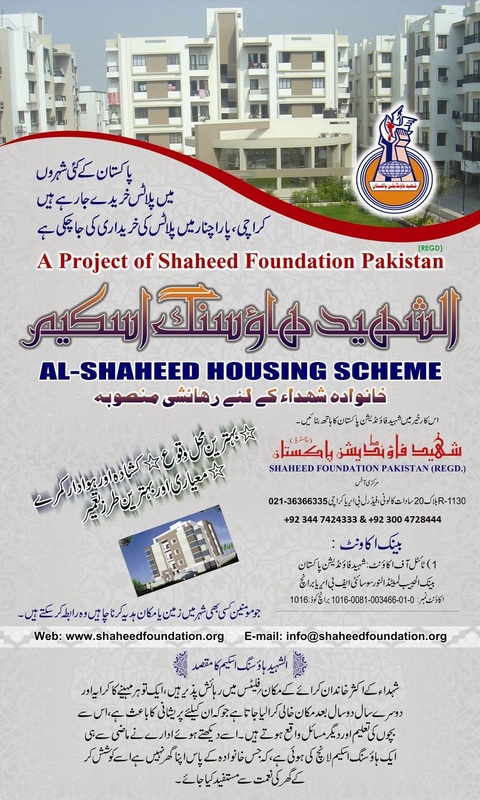 Contact details of Shaheed Foundation Pakistan are being produced for the convenience below.